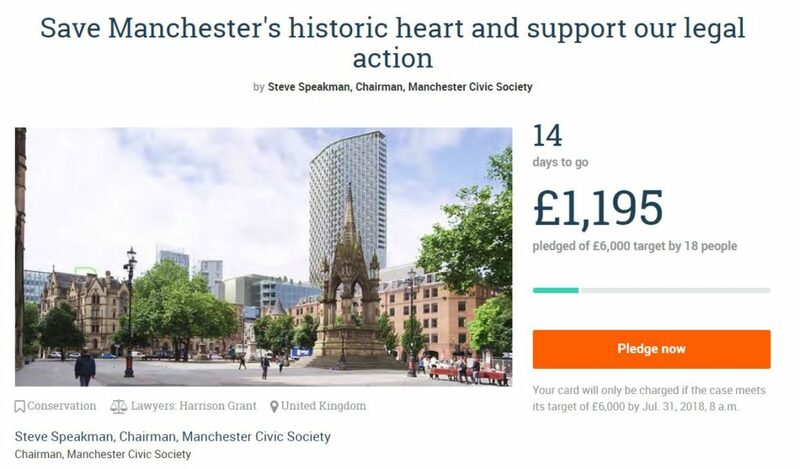 The Ancient Monuments Society today welcomed the launch of an appeal by Steve Speakman, Chairman of the Manchester Civic Society, to raise funds to review Manchester City Council’s decision to allow a 40-storey tower to be built in the historic heart of Manchester. Speakman’s appeal, set up through CrowdJustice, seeks to raise £6,000 to engage solicitor Susan Ring and Richard Harwood QC to establish whether there are grounds to challenge the decision to grant planning permission. The ‘St Michael’s’ proposal would not only lead to the loss of a 1950s synagogue and the part-demolition of a 1930s police station, it would also cause severe damage to the character of the Deansgate / Peter Street Conservation Area and change the appearance of Manchester’s streetscape and skyline for ever. Kathy Fishwick, AMS representative on the Manchester Listed Buildings and Conservation Area Panel, also Chair of North West Civic Societies’ Association, adds: “Manchester is a vibrant, living city, and whilst evolution is inevitable, it should not take the form of such an intrusive and harmful intervention into its established and valued heritage scene. This is surely a case where the restraints provided for by legislation should come into play. Click here to donate to the appeal.